Stay afterwards for our Annual General Meeting from 7:15pm – 8:30pm. We are excited to host another great community event with a Local Farmers and Artisan Market, Warm Soup and Hot Drinks, Door Prizes, Workshops, Kids Pumpkin Carving, Music and more! Support Local Farmers and Producers! Learn New and Creative Skills! 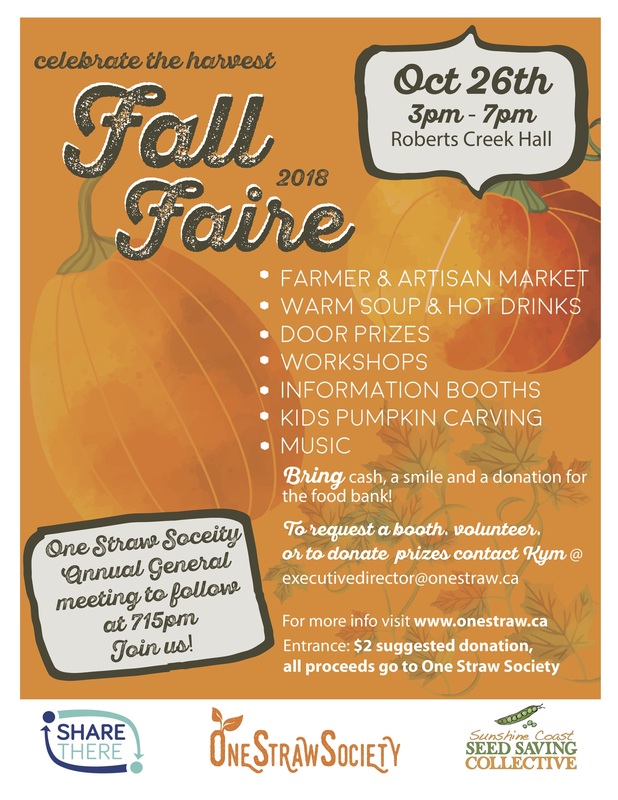 One Straw Society will also have an information booth where you can learn more about our programs, work and volunteer opportunities, share your ideas, ask questions and sign up for an annual membership (required for voting at our AGM). Enjoy a warm bowl of soup and a hot drink for a late lunch or a nice dinner before the AGM or heading home for a cozy evening by the fire. FULL DETAILS NOW AVAILABLE BELOW! All proceeds go towards One Straw Society. Exotic Fruit Nursery – Potted food plants with mostly fruit trees, bushes and vines. BREAD for revolution. – Food themed cards and t-shirts, using recycled materials.